If you’ve suffered from tooth damage or tooth loss, you may have considered dental implants. Giving the impression of a natural tooth, dental implants help bring your smile back and give you renewed confidence. They also give you all the other benefits a natural tooth would – such as structure to your face and the ability to chew as you once did with a full set of teeth. While you can be assured of top-notch dentistry and support throughout from AP Smilecare, ensuring your dental implants sit well is up to you. Today on the blog, we’ll be giving you some tips on dental implant aftercare and how best to look after your new smile. Resist the temptation to rinse your mouth after you’ve had your surgery, even if there is a small amount of blood from the procedure. If you do notice bleeding, place gauze over the area and apply gentle pressure while biting for five minutes. 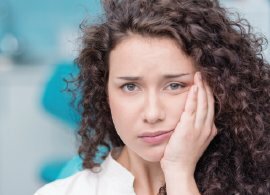 If the amount of bleeding causes any concerns, or the above does not appear to work, please get in touch with the team at AP Smilecare and we will advise you on what to do next. Holding an ice pack to your cheek can help any swelling that may occur. Pain, while it shouldn’t be much of a problem, can be relieved with regular painkillers. Only drink cold drinks and do not eat until the anaesthetic has worn off. After this, you can eat soft foods but hot drinks and hot food must be avoided for the first 24 hours. Avoid chewing with the dental implant for as long as possible. Of course, it also goes without saying that you should avoid smoking and alcohol for the first 24 hours. These aggravate teeth at the best of times, let alone after mouth surgery. Excessive exercise is also best avoided. 24 hours after your surgery you can begin rinsing your mouth. The ideal solution is as follows – warm salt water, made up of one teaspoon of salt in 200ml of cooled boiled water. Rinse carefully using this solution 3 to 4 times a day and after every meal. After day two, continue rinsing your mouth with the salt solution, as described above. You should aim to rinse more frequently, around 6 times a day. You should also use the mouthwash prescribed by us here at AP Smilecare. Following these simple aftercare steps is extremely important. They help your tooth to recover as quickly as possible and prevent any complications. A clean mouth always heals more quickly, which is why we’ve highlighted the importance of regularly washing out your mouth.